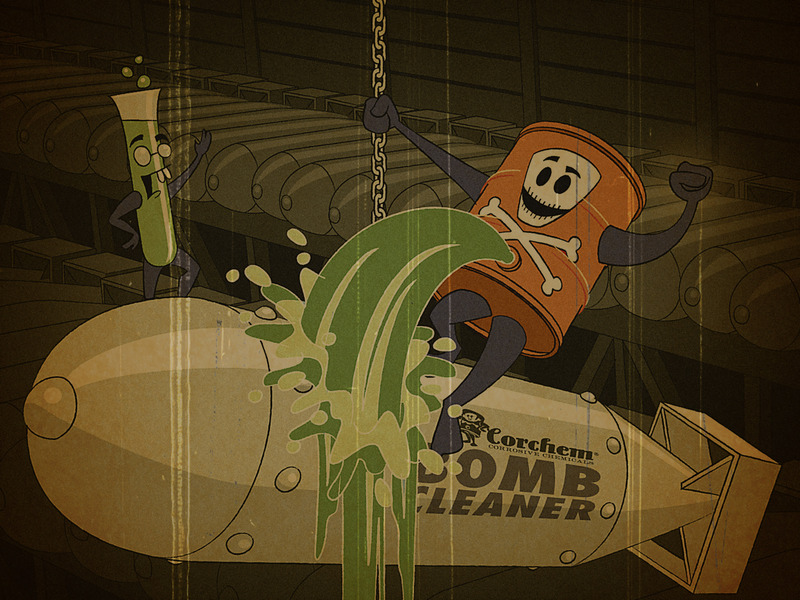 A mid-November atomic bomb test in 1941 behind Corchem Chemical. The explosion was a good two miles from where this photo was taken. Yeeeowwalczyk's first film partnering with Shanker Processed Foods. Zed Zedlin did a fantastic job bringing to life the characters he created. Interestingly, in this inaugural film the Shanker Processed Chicken was billed as "Bonehead the Chicken". In the following film, Don't Taste, Don't Smell, his name was changed for promotional reasons. 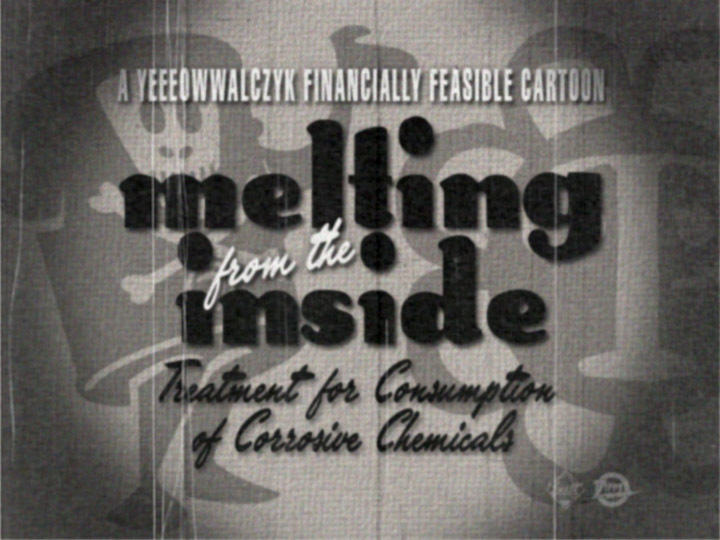 Created for Corchem Chemical as a means to sell solvent to the US military, Corrosive Chemicals for the Boys was Yeeeowwalczyk's first film produced for an outside company. The film marked the starting point of a new business venture for Crocker Yeeeowwalczyk - much to the chagrin of his father. A storyboard drawing from the infamous, but rarely seen Yeeeowwalczyk animated short film Whap, Poink & Bong. 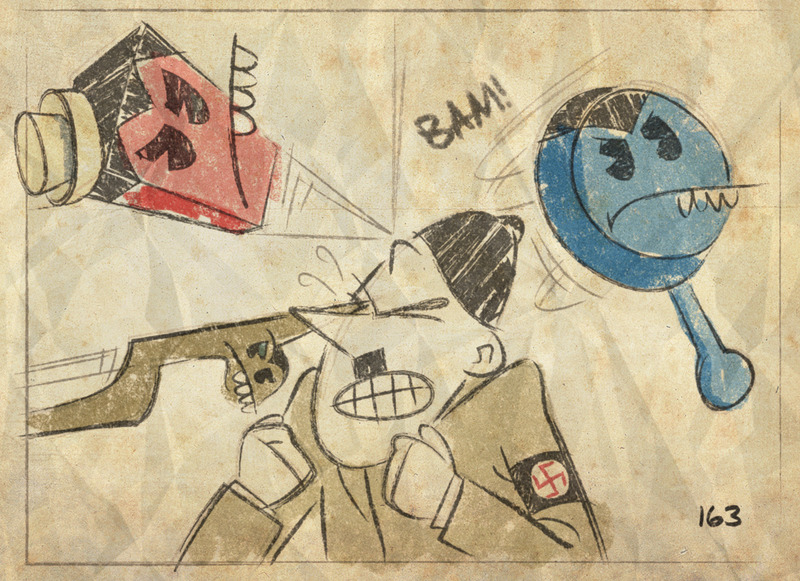 An anti-nazi tour de force where Hitler gets beat up by Red Brick and his buddies. 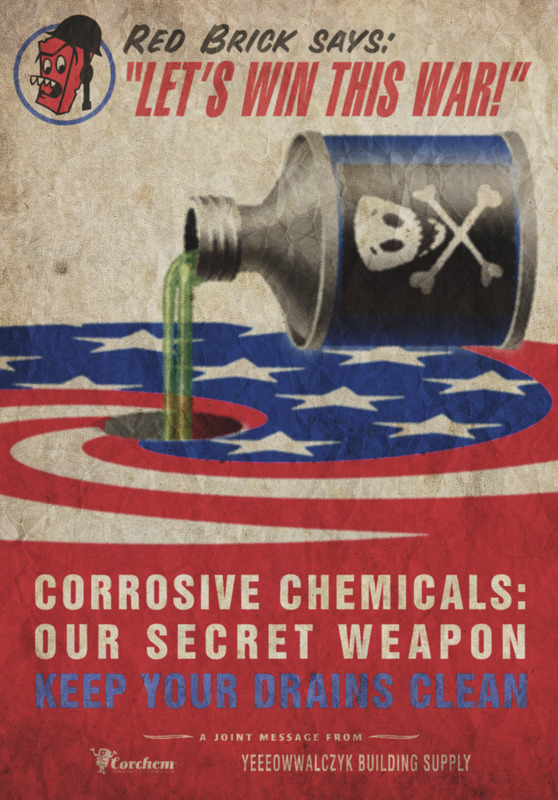 This was the second Red Brick film financed by the US government, the first being Bricks: America's Killing Machines. This is the inaugural Glandul•Aire cartoon, featuring Queen Glandul•Aire as well as Plunge and Scrub. The film's hi-jinx revolved around the "Glandul•Aire G400"— the outhouse Glandul•Aire would soon be offering to the US Military. 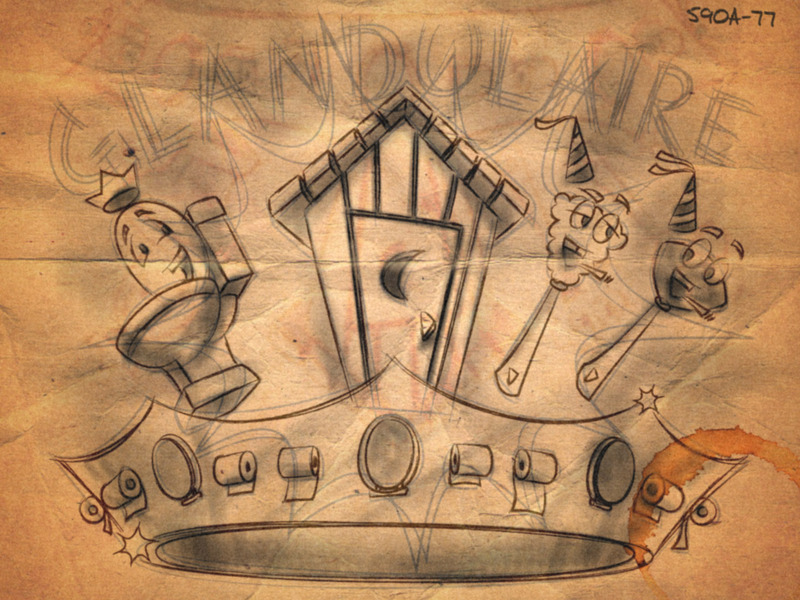 This storyboard drawing depicts the G400 being crowned the "King of Latrines". With the sudden passing of his father in February of 1942, Crocker Yeeeowwalczyk shuttered the building supply business and converted the building into a full fledged animation studio. By September Crocker christened the new business Yeeeowwalczyk Financially Feasible Animated Cartoons. 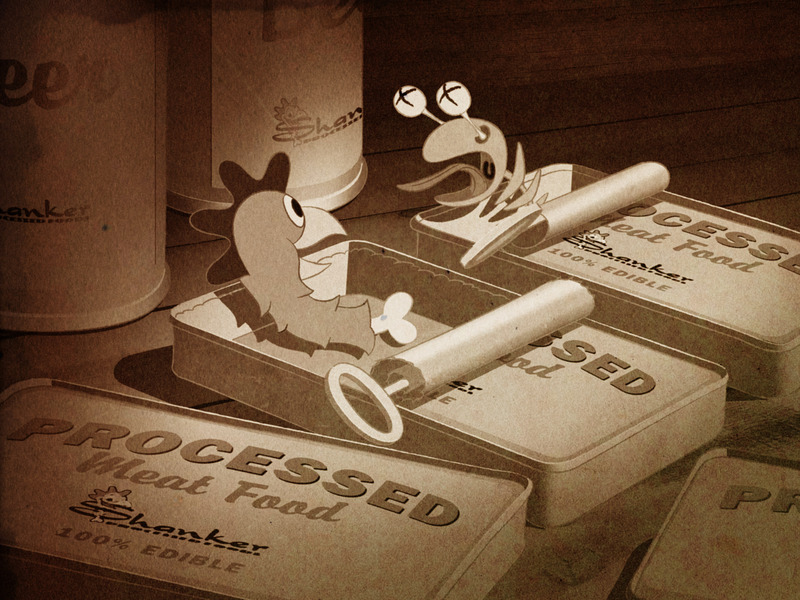 Before his father’s death, Crocker had been quietly forming an alliance with prominent businesses throughout Butane. The list included Corchem Chemical, Shanker Processed Foods, Glandul•Aire Abodeware, Pfride Pharmaceuticals and the Forceps Toy Company. 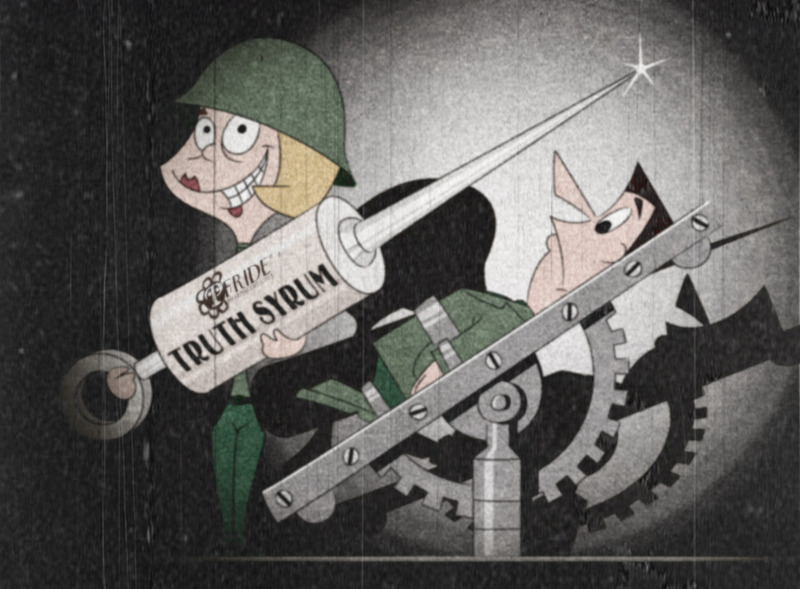 Established at the advent of World War II, the intent of this business coalition was to use animation as a tool to promote products and patriotism. The US Government funded these short films and distributed them domestically and overseas. Audiences found them entertaining and informative, while the Butane companies enjoyed the promotion. Crocker Yeeeowwalczyk called it "Promotainment". A film of firsts. The first film under the "Yeeeowwalczyk Financially Feasible Cartoon" moniker. The first film for Pfride Pharmaceuticals. And the introduction of the Pfride "Peppy Poppy" logo.Red Brick Comics was a natural evolution from films for Crocker Yeeeowwalczyk. All of Yeeeowwalczyk’s affiliated companies – also known as "Promo-pals" – have been represented in the comic throughout the years. The going price for Red Brick Comics #1 is roughly $65,000. Red Brick Comics was a natural evolution from films for Crocker Yeeeowwalczyk. All of Yeeeowwalczyk’s affiliated companies – also known as "Promo-pals" – have been represented in the comic throughout the years. 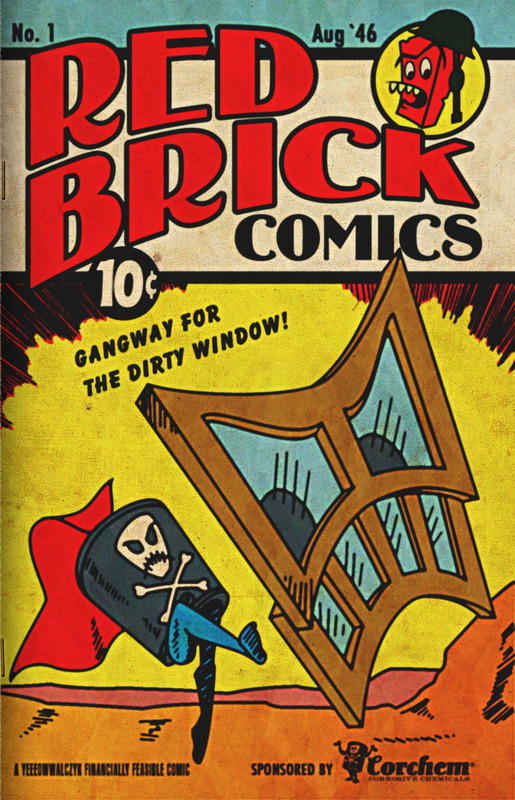 The going price for Red Brick Comics #1 is roughly $65,000.